The Genesis Model 1 doesn’t output stereo through the rear A/V port; that port only outputs mono sound. Luckily, the front headphone jack does output stereo, so the Genesis 1 cables listed above have a 3.5mm headphone cable that routes stereo audio through the SCART connector. Many people (including myself), have found the audio from the headphone jack to be distorted on some Genesis systems (most likely a result of a dirty POT over time). The best solution I found was to pull the stereo sound directly from the headphone amp on the Genesis motherboard. This way, you get a clear line-out signal from a pretty simple mod. Please follow the link below if you’d like to know how to do it and if you use a 3.5mm jack for the mod, you can still use the exact same cables listed above. It’s my opinion that regardless of the Genesis model, you should get a Genesis 2 RGB SCART cable. 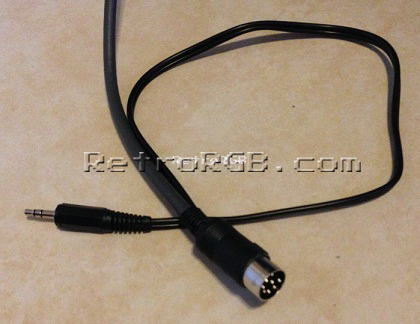 Then, if you have a Genesis 1, get the 32x female adapter cable listed in the 32x section. This will ensure total compatibility across all Genesis consoles and accessories and in the long run may actually save you money.